To create this layout first I cut my mats, frames, background and borders from various tropical printed papers and solid card stock. I then attached these pieces to my layout in my desired positions. A little tip to get the perfect layout, is to sketch it out on paper before you start. I always start every card or layout I do with a preliminary sketch. This way I can make any adjustments I may need easily without wasting any paper. Once my desired layout and placement was finalized, I then cut out all of the pattern pieces with my Explore. Next I inked and chalked each little paper piece and glued them together. Here is a little tip for shading your paper pieces. To add extra dimension to a paper piece you can actually add more depth and details with your artist chalk. I did this very thing for the palm tree trunks and the girl's grass skirt. I felt that the cut out shapes were too flat, so by using #6 round watercolor brush and just a small amount of water combined with the chalk pigment, I was able to paint in all of the details. Lastly to complete my layout, I then attached all of my paper pieces, added highlights, and then glued some little sequin shells on the sand. Thanks so much for stopping by! I hope that you enjoyed my project! 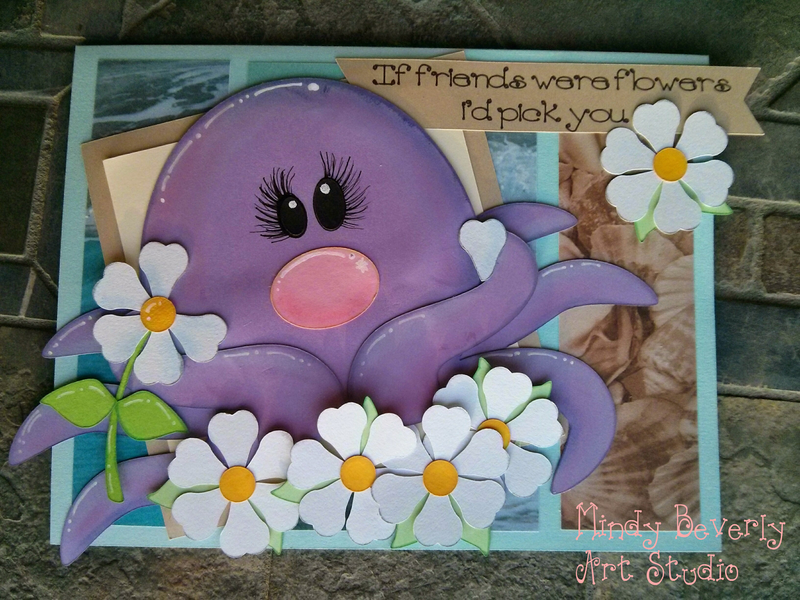 To make this card first I cut a horizontal accent color to simulate a ribbon and attached it to my card. I then chose a fancy frame from Design Space and cut the background layer in a dark blue and the top layer in an ocean print paper. Next I cut the sand shape from a sand print paper and then glued that to my card as well. I then cut out all of the pieces for this cute bear with my Explore. Next I inked and chalked all of the little paper pieces and then assembled them. Next I then used a little beach sign image from Design Space and removed all of the top layers. After that I added my text to the sign and attached the text to it. I then inked and chalked the sign. 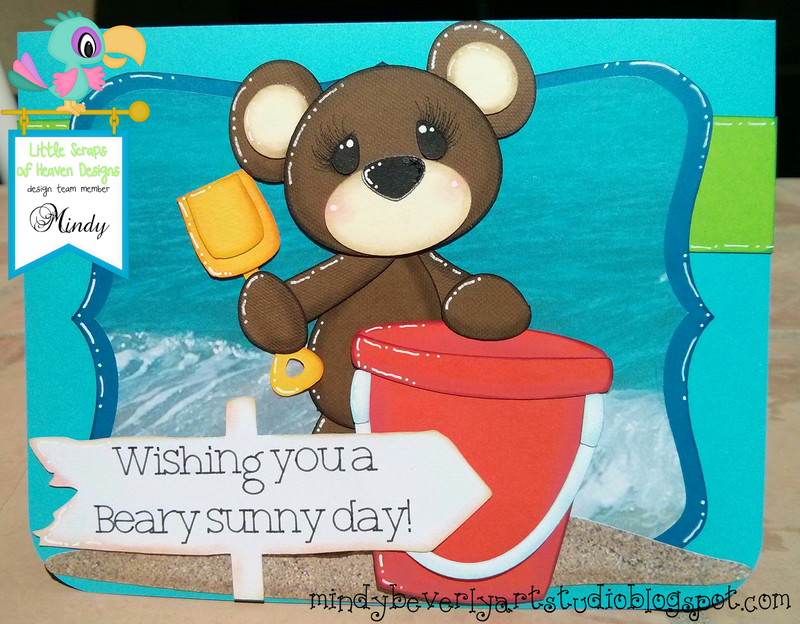 To finish I attached the little bear and sentiment to my card with foam tape and then added all of the highlights with a white paint pen. Thank you so much for stopping by! Have a wonderful day! 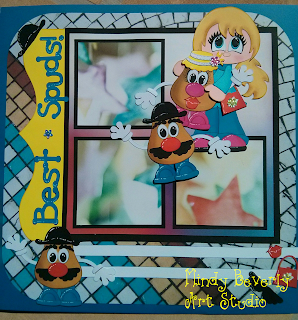 To make this card first I cut various sized mats and frames in plain colored card stock. Then for the patterned card stock I used the coordinating digital backgrounds and printed them onto plain white card stock. Next I cut out the remaining mats in my custom printed card stock. I then cut out all of the little paper pieces for the squirrel and walnuts with my Explore. After that I inked and chalked all of the edges of the little paper pieces. I then assembled them and attached them to my card base. Thank you so much for stopping by today! Happy Tuesday! 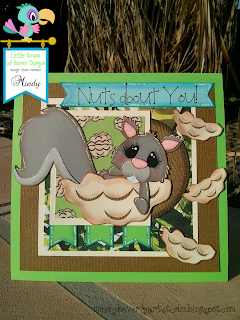 Today I wanted to share with you two cards that I created for two extra special little kids! (created with patterns from TBD) The first card is a Racing Card! 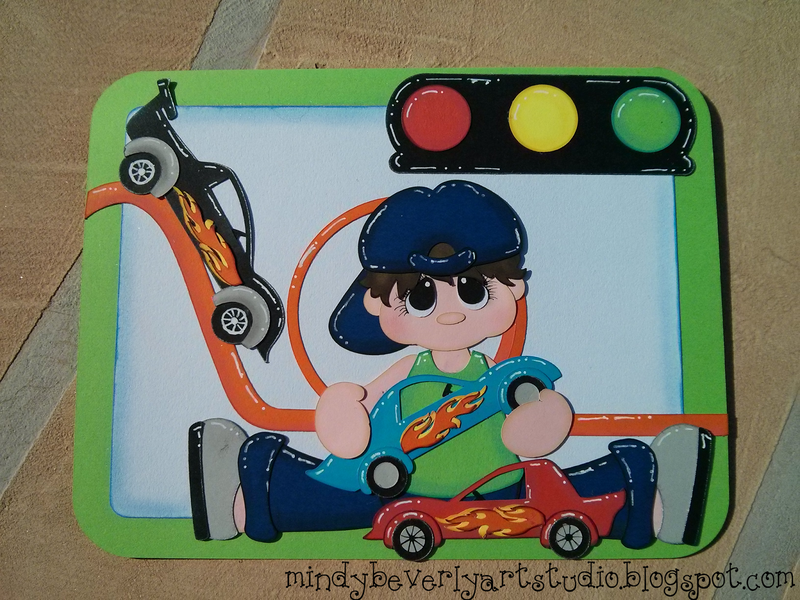 The special little guy that I created it for loves Hot Wheels, so I thought that this would be perfect for him! To make this card first I cut a basic card base in Design Space. I then inked the edges of the white layer and then glued them together. 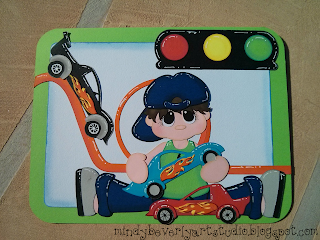 Next I cut out all of the pieces for the racing boy and racing cars. I ended up combining files on this one to get the desired look I was going for. Next I inked all of the little paper pieces and then shaded them with Artist Chalk. Last but not least I assembled all of the paper pieces and then attached my completed design to the card. 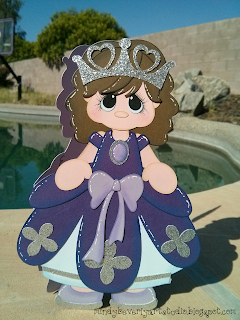 The next card that I created is for a special little girl that loves princesses! I decided to do a Sophia card, because I don't know a little girl that doesn't love Princess Sophia! The file I used was just a basic file, but I decided to turn it into a shape card. 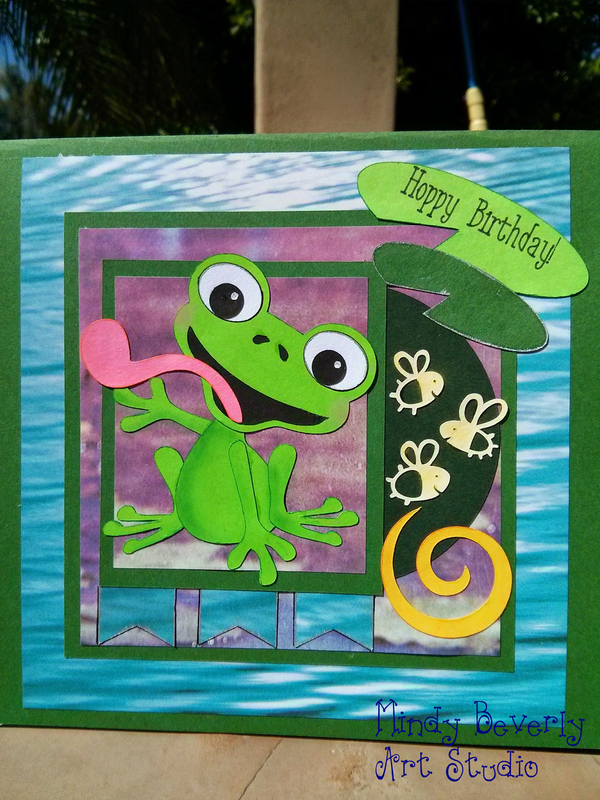 I took the image and welded it together in Design Space to create the card base. 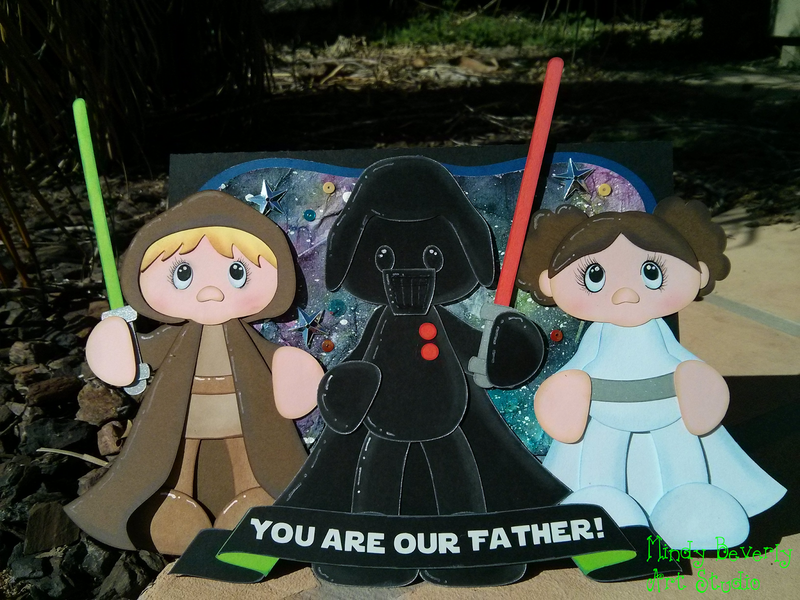 I then cut out all of the little paper pieces for the princess. I decided to cut the Tiara and other accents in glitter cardstock to give some extra dimension. I then inked and chalked all of the paper pieces to give more depth and realism! Lastly I attached all of the elements to the card base and then added the highlights with a white paint pen. I think these little kiddos are going to love their cards! Thank you so very much for stopping by! Have a wonderful day! 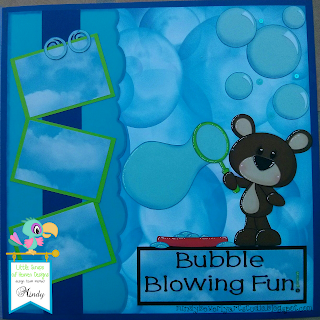 To create this layout first I attached various shades of blue papers and card stock to the background, I then shaded the bubble border edge with artist pastels to add dimension. Next I inked and chalked each of the little paper pieces of the bear and glued them together. I then attached the bear and photo frames to my layout. To finish this piece I used a white paint pen to add all of the highlights and details on the bear and bubbles. I hope that you enjoyed my project! Have a wonderful day! To make this project first I spray painted a plain mason jar blue. Next I made a vinyl star stencil with my Cricut Explore. I then wrapped the star stencil around the dry blue mason jar and then spray painted the stars white. After that I removed the vinyl stencil giving me perfectly crisp white stars on a blue background. Next I added some ribbon around the jar and a wire spritz of tiny stars inside the jar. I really wanted to add some bigger stars for more impact, so I just sized the stars from the pattern and then made multiple cuts of them from glitter cardstock. I then glued all of the glitter stars at various positions among the wire spritz. Next I cut out all of the pieces for the little mice and Title. I then inked and chalked each paper piece. Lastly I assembled them and then glued them to the mason jar and top of the wire spritz. It really was super easy to make even though it looks very detailed! Thank you so much for stopping by and have a wonderful day! I decided to make these fun little guys into a shape card. 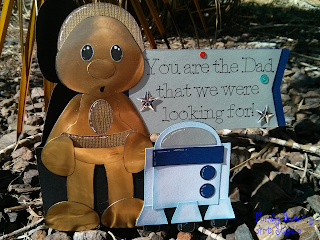 For C3PO I wanted to use a gold metallic foil paper to make him look just like he does in the movies, I love how the metallic paper cut and gives him so much added dimension! I used my Cricut to cut out all of the little pieces. I then inked all of the edges, chalked each piece to show depth, and then glued them together. Next I attached C3PO and R2D2 to my card base with foam tape. Last but not least I added little round and star shaped sequins to the sentiment. Thank you so much for stopping by! I hope that you have a wonderful day! Today I wanted to share with you a Father's Day card that I created using files from LSHD. My Husband is a huge Star Wars fan, and I thought that this would be the perfect card for him! To start I painted a galaxy scene in watercolor for the background and then added little star and circle sequins for added dimension. I then framed the watercolor image in a dark blue border and attached it to the card base. For the characters I inked, and chalked all of the paper pieces, I then glued them together and used a micron pen to add the eye lashes. For the sentiment I used white vinyl and then attached it to the banner. Finally to finish the card I attached the characters to the card using foam tape so that they would pop up off the card. I hope that you enjoyed my card! Thank you so much for stopping by! Hello Friends! Today I wanted to show you how I took my 3 part Cherry Blossom Tutorial and changed up the color palette to create an entirely different painting! By using different colors on your subject matter, you can create a different new mood! Just think of all the possibilities you can create with just a single painting! The colors I used for the flowers and branch are the same as in my tutorial, For the background I changed things up and used Sap Green, Yellow Green, and New Gamboge. I hope that you will paint along with this weeks tutorial. Thank you again for stopping by! Hello again and welcome! Today is the final section of my three part watercolor tutorial. Here is what your finished painting should look like after completing the instructions for today. 5. 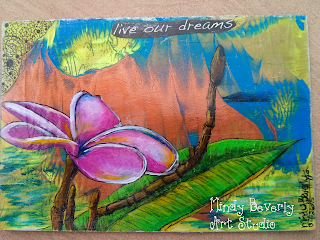 With a #10 round brush paint Turquoise next to the stem and flower petals in the center of the picture. 6. Next clean the brush and swipe clear water next to the painted area, and allow the Turquoise to diffuse across the background. Keep repeating the swipes with clear water until the Turquoise fades to white at the edges of the paper. 7. While the background is still damp quickly swipe Opera Rose, New Gamboge, and Ultra Marine Blue accents and allow the paint to spread out and create movement. 8. 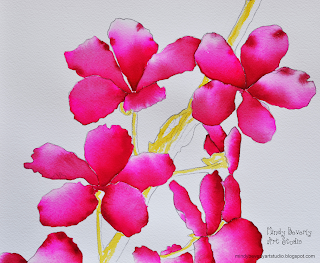 Using the White Paint Pen draw in the highlights on the petals and filaments of the stamen. 9. Then using New Gamboge and Alizarin Crimson paint the details on the filaments of the stamen. 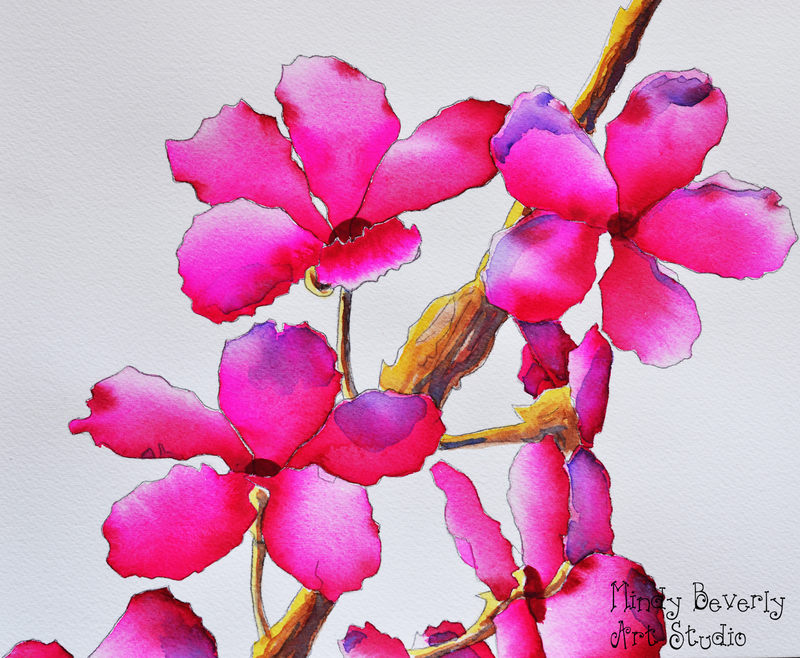 You now have a beautiful completed Cherry Blossom painting! Thank you so much for stopping by! If you have painted along, I would love to see your finished piece. Please post your pictures in the comments section of this post. I hope you have a wonderful day! 5. Using a #6 round accent each flower center with Alizarin Crimson. 6. Then still using Alizarin Crimson add some darker spots into the folds of the petals with the touch and pull method. First paint a small drop of Alizarin Crimson in the areas you want to accent. Next clean your brush and then swipe some clear water right next to the drop. The paint will be pulled into the clear water and spread out in a gradient. 7. Use the same touch and pull method for the shadow areas of the petals with Violet. Using a slightly damp #8 round swipe Burnt Sienna and Ultra Marine Blue on the stem in the shaded areas not being hit by the sun. Make sure that you still preserve some of the highlighted areas. Thank you so much for stopping by my blog today! I hope to see you back here tomorrow for the final part of my watercolor tutorial series! It's a beautiful rainy day here in Arizona and as promised I am going to share with you the first part of my painting tutorial! This tutorial will be a 3 part watercolor series. 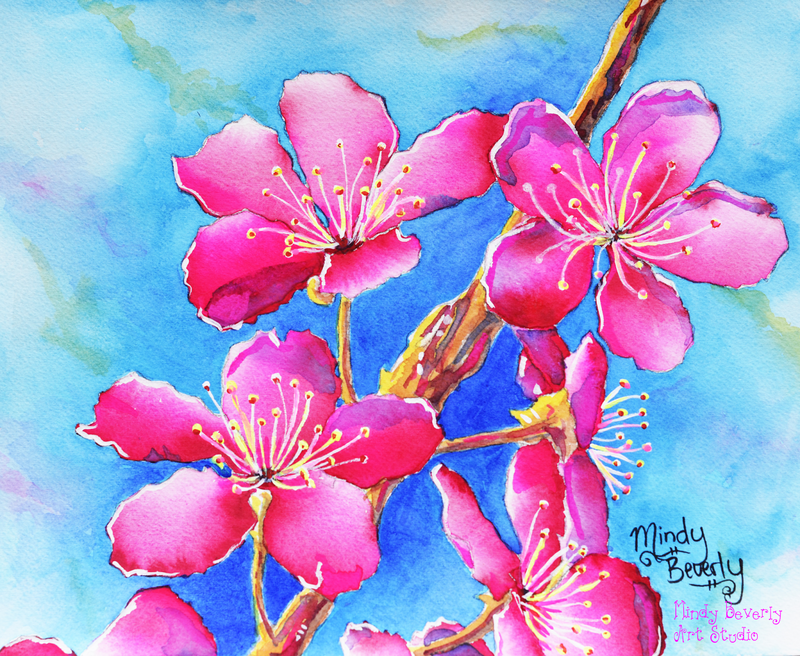 If you follow along, by the end of the week you will have completed a beautiful Cherry Blossom painting! -Paints: New Gamboge, Opera Rose, Violet, Alizarin Crimson, Turquoise, Burnt Sienna, and Ultra Marine Blue. This is going to be what your painting will look like after completing the instructions for part 1. Sketch the image on watercolor paper with the HB pencil. Remember to read the directions for each layer before you begin painting. 1. Paint the small petals in the back of the other petals first, so that you have a better idea of how much water and paint to use for more important petals. 2. Paint water in one petal shape. Move the drop of water to the edge closest to the flower center. Wick Opera Rose into the drop and then move the drop along the shadow part of each petal and then let the color fade towards white at the highlight. 3. While the petal is still wet, move the drop back to the center of the flower and then wick Alizarin Crimson into the drop and move that drop along the shadow edge to give dimension. 4. Paint every other petal using this same technique. Make sure that you do not paint petals that are right next to each other while they are still wet, otherwise they will bleed into each other. 5. Using a slightly damp #8 round swipe New Gamboge on the stem in the area being hit by the sun. Make sure that you leave some white highlighted areas. Thank you so much for stopping by today! I will see you again tomorrow for Layer Two of this painting! Today I wanted to share with you a watercolor painting I finished of the same Plumeria that I painted before in Acrylics. As you can see the same subject matter can look totally different when completed in a different medium! I just love the vibrant colors that I can achieve with watercolors! This painting was completed on 140 lb. watercolor paper using artist grade watercolors. Also make sure that you check my blog each day this week. Starting tomorrow I am going to be doing a step by step watercolor tutorial with a different part of the tutorial listed each day. If you follow along, by the end of the week you will have a completed painting! Thank you so much for stopping by and see you tomorrow! 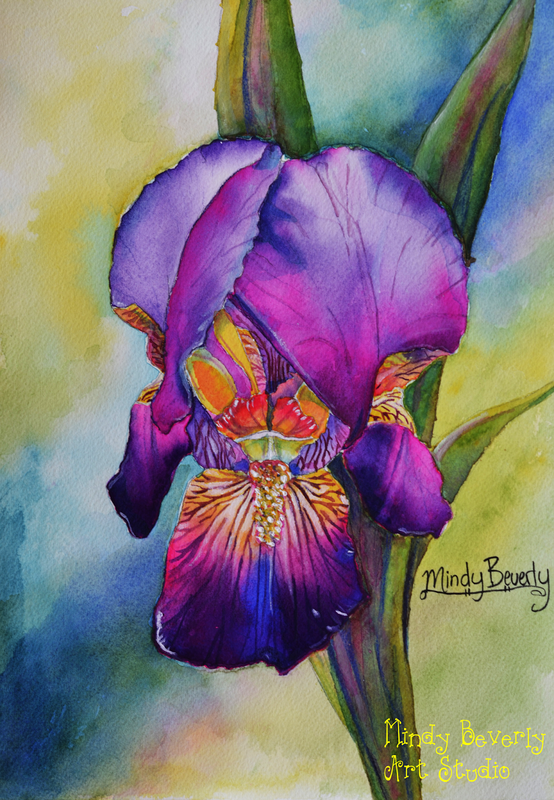 Today I wanted to share with you a painting of a Bearded Iris that I completed in Watercolor. I used Arches 140 lb. watercolor paper and Lucas artist grade watercolor paints. I first created a sketch from various photos I took of a Bearded Iris. I then painted the background with a wet into wet wash and then repeated this same process to add more contrast and depth. Next I painted the stems by using various shades of blue and yellow. I wanted to let these colors mix optically into green on the paper itself instead of premixing the greens. Then for the petals of the Iris I used the wet into wet method again and dropped in my medium tones. I then re-wet each petal section and did another wash of the darkest values. Lastly I dotted various shades of brown, orange, and yellow on the flower stamen to complete my painting. I hope you enjoyed my work today! Thank you so much for stopping by! 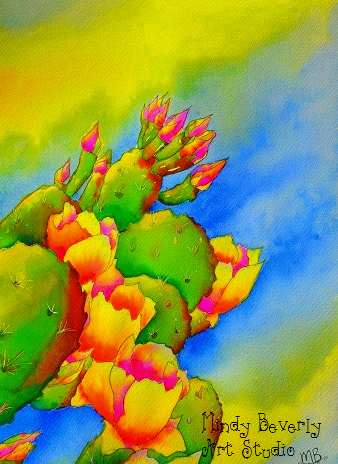 Today I wanted to share one of my watercolor paintings titled "Desert Blossoms." I painted this piece on 140 lb. watercolor paper. 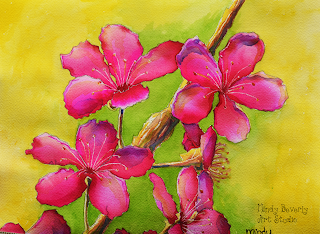 My vibrant colors were achieved with Lucas Studio grade watercolor paints. The image I used is from a photograph that I took here in Arizona at the Desert Botanical Gardens. First I sketched the image from various photographs that I took to get my desired layout. I then painted the background using a wet into wet approach and then increased the drama by doing a second wash with less water and more pigment. I then painted in a light wash on the cactus of the lightest values. I then increased the dimension by layering the medium tones followed by the darkest values. Lastly I used a razor blade to scrape out the highlights of the cactus spikes and then layered a light wash of color over them to add more realism. I really hope you enjoy my painting! Thank you so very much for stopping by! Today I also wanted to share with you some fun paper pieced projects that I recently completed! 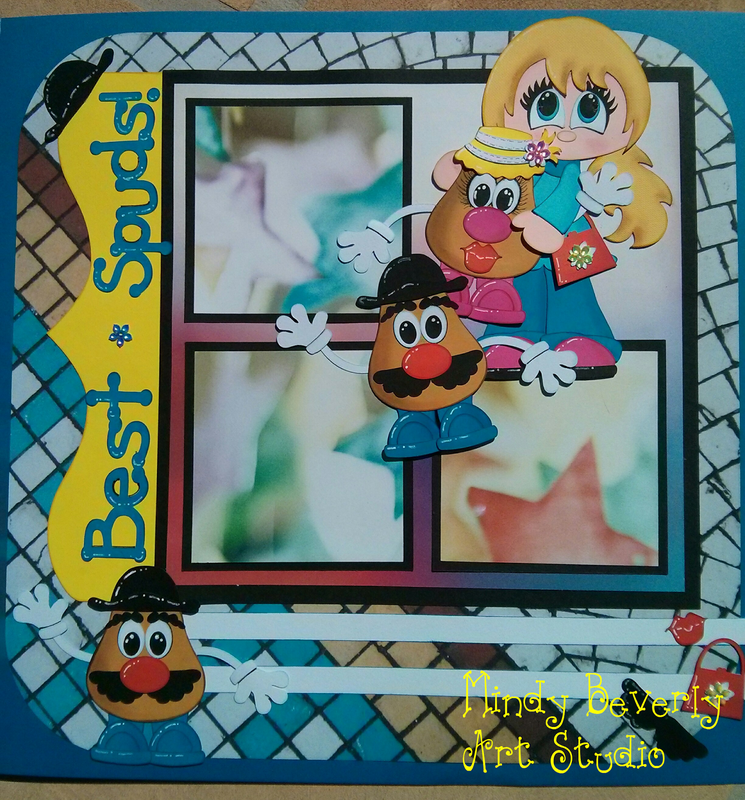 The first is a 12X12 scrapbook layout. (Created with a pattern and sketch from LSHD.) I cut out all of the pattern pieces with my Cricut Explore. I then inked and chalked all of the little paper pieces to add dimension. Lastly I used a white paint pen to add highlights to all of the elements after assembling everything. 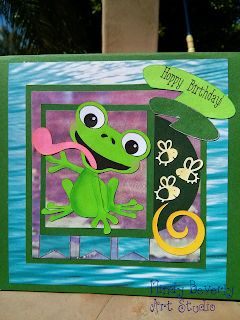 The second project I completed is a 6x6 Birthday Card. (Created with a pattern and sketch from LSHD,) The little bugs used are from Cricut Design Space. I completed this card in the same way that I did the layout above. All the paper pieces were inked and chalked as well. The last project that I am going to share with you today is this cute little Octopus Friend Card! (Created with a pattern and sketch from LSHD.) 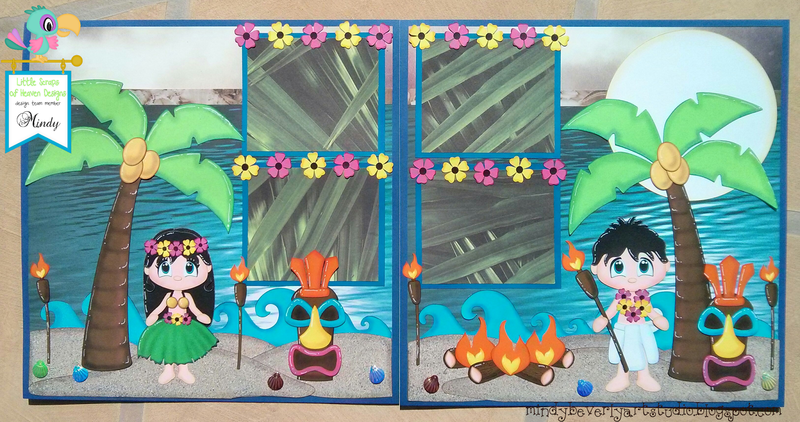 I used Recollections Beach themed card stock for the background. I also inked and chalked all of the paper pieces. The highlights were then added with a white paint pen. For the sentiment I used the write then cut feature in Cricut Design Space. Thank you so very much for stopping by. I hope you have a great day! 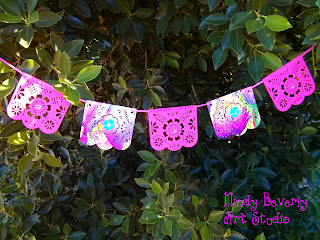 Today I am sharing with you a couple of projects that I completed for a monthly Art Swap! The first piece I created is a 5x7 postcard that I painted with Acrylic paint on a card stock background. I then finished the piece with a layer of Acrylic Gloss. 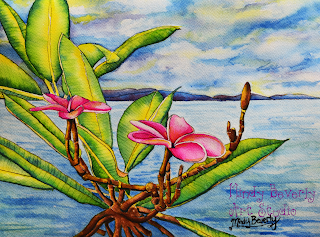 The image of the Plumeria flower is from a photo that I took while in the Virgin Islands with my Husband. The theme for this particular Art Swap was positive affirmation. I chose the sentiment "live our dreams." The second piece that I created is an intricately cut decorative banner. I used my Cricut Explore to cut out all the banner pieces. 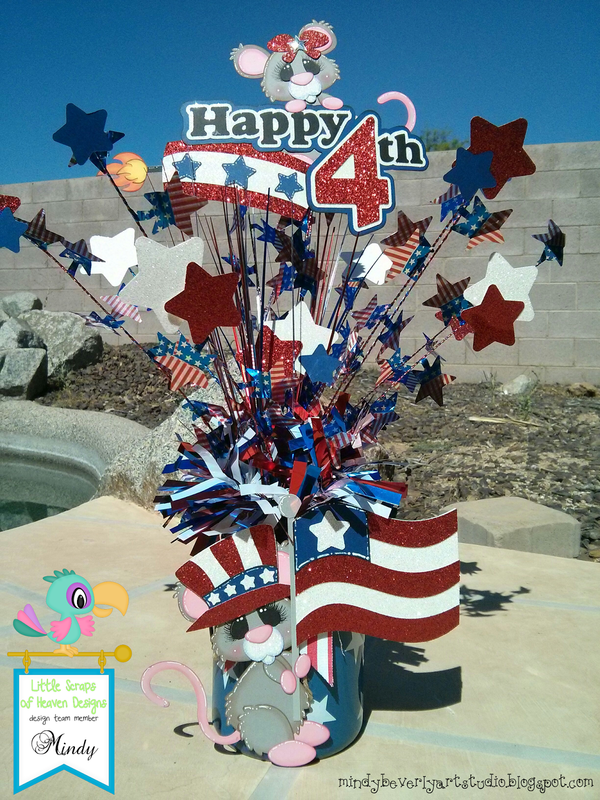 The 3 bright pink pieces were cut out of card stock, and the 2 remaining pieces were cut out of 140 lb. water color paper. On the two water color paper pieces I painted a Bearded Iris in Lucas water colors and then embellished them with 3-D floral elements from Cricut Design Space. Lastly to complete this project, I hand beaded and sequined each of the banner pieces.Thank you so much for stopping by! Have a wonderful day!